I've been adopted! My new sweetie is Tallulah Rabbit, known by many as the most beautiful Dutchie in the whole world! My new humans are photographers so you'll see lots of beautiful photos of me on Tallulah's page! I would say hello, but you just woke me up from my nap and I am not especially happy about that. My name is Darwin and as you can tell, I am a proud Netherland dwarf boy. 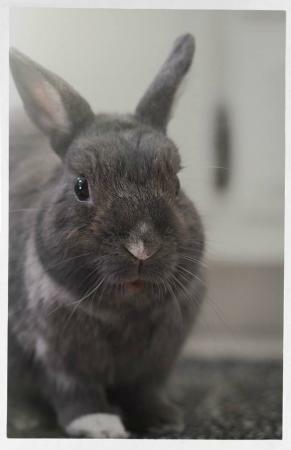 I recently arrived at SaveABunny as a medical rescue from the San Jose shelter. My eye was weepy. But I am doing much better now. Rumor has it that I am going to get neutered soon. But since my ears are so tiny, I choose to pretend I didn't hear that. I am a little shy, so I would prefer to be adopted into a quiet home. Let's share a salad together soon!